Market-leading single ply roofing manufacturer Sika Sarnafil, architects Cullinan Studio and Roofing Contractors Cambridge (RCC) are celebrating following a win at the first-ever AJ Specification Awards. 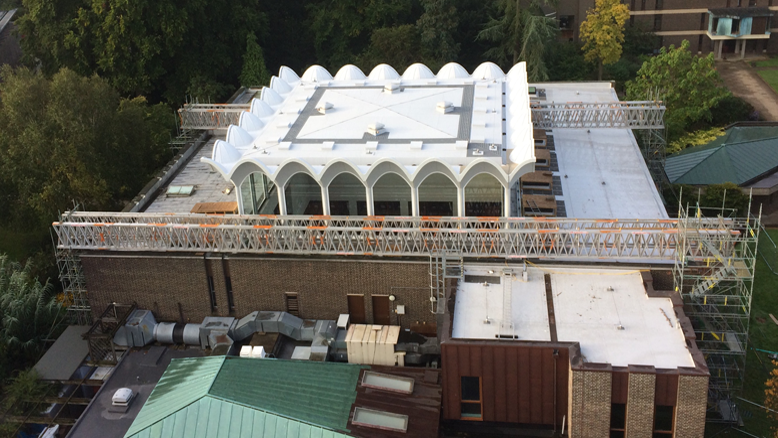 The roof refurbishment of the Central Building at Cambridge University’s Fitzwilliam College – one of the first major projects to use a pioneering, new approach to Sika Sarnafil’s products – came out on top in the Roofing and Drainage category. In what was a skilful collaboration between Sarnafil, Cullinan and RCC, the judges agreed there was something special about the way this unique brutalist building had been beautifully protected. Comprising protruding ‘scalloped’ detailing, an innovative waterproofing solution was created to refurbish the highly complex roof, all without visually altering the original 1960s Denys Lasdun design. Sika Sarnafil’s single ply membrane and Sikalastic 621 – a liquid-applied product typically used for areas with complex detailing – were used across large areas. This pairing of systems was further enhanced by Sika Refurbishment’s SikaFloor 420. Sika Limited’s concrete products were also specified for the build by concrete repair contractors Gunite Eastern. Sika’s innovative concrete repair system included a steel corrosion inhibitor. Sika® FerroGard®-903+, which penetrates the concrete and forms a protective monomolecular layer on the surface of the reinforcing steel, was used alongside Sika MonoTop® repair mortars. The concrete was finished with Sikagard®-550W, a high-performance anti-carbonation coating, with crack-bridging capabilities, that protects the concrete, while meeting the aesthetic requirements of the structure. Sika has a wide range of products available for most applications within the construction industry, which can range from waterproofing, flooring, concrete, sealing and bonding, facade, roofing and refurbishment applications, as well as teams of specialists available to advise on specific projects. Using a combination of systems, while working internally within the company, Sika was able to advise on the most suitable materials for different aspects of the project and ultimately provided a complete building envelope solution, with the client benefitting from having only one supplier to deal with.